"Increasingly, he devoted his energy to anti-apartheid activism, and his columns took on a new urgency," wrote Tim Murphy. "He read a lot of Frantz Fanon, the Marxist anti-colonialist writer from Martinique, and in 1985 he attended a campus speech by Louis Farrakhan, the controversial Nation of Islam leader who blended calls for black empowerment with lengthy diatribes against Jews, gays, and other groups." Ellison has long attempted to downplay his support for Farrakhan and the Nation of Islam, but Murphy wrote that Ellison was far more involved with the group than he currently says he was. 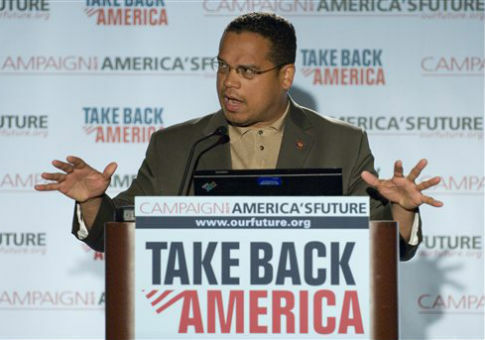 Organizers that worked with Ellison on his unsuccessful run to be a Minnesota state representative in 1998 told Murphy that Ellison would show up to campaign events wearing a Farrakhan-esque bow tie along with members of Fruit of Islam, which is the Nation of Islam's security force. A Minnesota Nation of Islam leader said that Ellison spent several years as a "trusted member of our inner circle," officially serving as the local group's chief of protocol. Members of the Nation of Islam told Mother Jones that Ellison's current treatment of Farrakhan is the "ultimate betrayal." In December, the Nation of Islam's official newspaper called Ellison "cowardly" and a "hypocrite." This entry was posted in Politics and tagged Anti-Semitism, Democratic Party, DNC, Jewish Community, Keith Ellison. Bookmark the permalink.